So, Concord still have flight in this season's FA Cup. We started the evening with five non-league teams in action and three of them managed to stay in the competition - Concord Rangers, AFC Telford and Southport. Could one of those three be lining up at Anfield, Old Trafford or the Emirates at the beginning of January? There's still plenty of work to do before that happens, but the dream is still alive. here in the morning. Enjoy. League Two Shrewsbury are making a habit of cup runs this season. They almost shocked Chelsea in the fourth round of the Capital One Cup and are now in the second round of the FA Cup after a 1-0 win over League One Walsall. Shrewsbury manager Micky Mellon speaking to BBC Radio Shropshire: "I'm delighted for them all, as a collective group we were superb. "It was a poor surface but we still managed to play good football. It's important we won tonight for a lot of reasons, financially as well as for the fans, to go to Preston in the second round will be another good day out. "The lads are playing well, it's a really strong group with even more players knocking on the door of the first 11." AFC Telford's 2-1 win over Basingstoke was all the more notable for the injury list the home side had on their hands ahead of this one. They could only name five subs for tonight's game, and were reduced to 10 men in the second half. AFC Telford manager Liam Watson speaking to BBC Radio Shropshire: "We couldn't do anything about the injuries, we just had to go along and field the team we did. We have to be sensible how we look after them in the next few weeks. There has been an awful lot of work. "We're a part time club in a full-time league, and we've already shown character in games this season. We have to conserve energy and I have to make sure the players are in the best nick to play in games." Watson's side have a dream trip to Bristol City to look forward to in the second round. Gary Bracci: I urge every footy fan to find a video of Jordan Chiedozie's goal from tonight's game, rocket off the post! Bury v Luton, Cambridge v Mansfield or Concord Rangers, MK Dons v Chesterfield, Oldham v Doncaster, Oxford Utd v Tranmere, Preston v Shrewsbury, Sheffield Utd v Plymouth, Accrington v Yeovil, Wrexham v Stevenage or Maidstone United, Gateshead v Warrington Town, Barnsley v Chester, Bradford v Dartford, Bristol City v Telford, Cheltenham v Dover, Scunthorpe v Worcester City, Southport v Eastleigh, Portsmouth or Aldershot v Rochdale, Wycombe v Wimbledon, Colchester v Peterborough. There were very few alarms for Doncaster tonight, who even had the luxury of having an early goal chalked off. Following the game, Rovers players gave their shirts to their travelling supporters. A top night all round for those lucky 11 fans. And here it is, the goal that carried Rochdale into round two and selfishly denied us all some FA Cup extra-time. Oliver Lancashire's stooping header got the job done and Dale, eighth in League One, are ticking along nicely. BBC Radio Shropshire's Nick Southall tweets: "That was tense but what a result for Telford United in so many ways! Next stop Bristol City in round two." 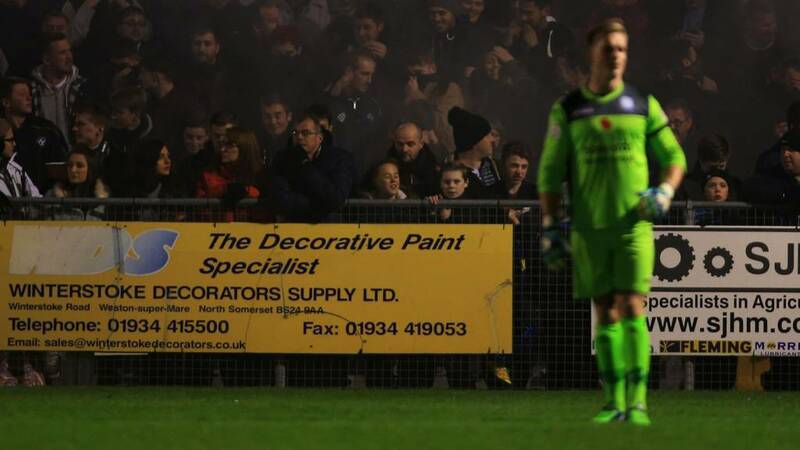 Were you one of the 101 Concord Rangers supporters at Mansfield? Send us a picture of you celebrating a famous result in your club's history. "What a result for Concord, they've done south Essex proud, they've done non-league proud. "Every single one of these Concord players, and the manager Danny Cowley, have given their all for the team tonight and deserve all the credit. "101 away fans have made the long journey to Mansfield tonight, and they will be so proud of their team. "Mansfield will not be relishing a trip to Thames Road and Danny Cowley got his tactics spot on. It was a fantastic goal to get the draw, and what an overall performance." An all Conference tie in round two then at Eastleigh. Talk about a carrot being dangled. Cue manager's of both clubs saying they are not thinking about round three. "Doncaster have done a professional job here. They're a good bunch of lads who have worked hard for each other and this will bode well for the rest of the season." Donny set up a trip to Oldham. Liam Monelle achieves his probable dream of scoring in injury time for non-league Weston-Super-Mare against League One Doncaster. Unfortunately for him, Donny already have four on the board. Too little too late. Non-league AFC Telford march into the second round for the first time in their 10-year history. Bring on Bristol City. You're off to Portsmouth or Aldershot, Dale fans. Preston will host the Shrews on 6 December. Fancy a trip to Stanley Yeovil fans? Go on then, get yourselves on that M6. Mansfield's Swiss goalkeeper Sascha Studer is named man of the match. A sign of how well Concord Rangers have done. They'll be dancing on the streets around Spotland tonight, thanks to that man Oliver Lancashire who bags a winner four minutes into injury time. Former Sheffield United striker Keith Edwards on BBC Radio Sheffield: "It's been a comfortable victory and we've kept a clean sheet. We should have done better in the final third but Nigel Clough should be satisfied tonight. They look a tough side to beat and the confidence should come back after a performance like that." "No traffic movements for ten minutes after the game," says the announcer at Accrington Stanley. No one leaving yet as Stanley have just two minutes of injury time left to survive. They look like they will do it. Accrington Stanley...who are they? Couldn't resist. Basingstoke's Jamie Brown can start running the bath after being given his marching orders for a second bookable offence. Concord goalkeeper Josh Vickers makes a fine save from Chris Clements's free-kick. Five minutes of injury time to be played. York keeper Michael Ingham is caught up-field as the away team chase the game. It does not end well for the visitors, with Matt Tubbs slotting home from outside the box. Mansfield supporters are heading for the exits now. Two minutes to go and Adam Murray's dipping effort goes just over. "Rochdale have the momentum now. The Cobblers are not offering anything by way of an attacking force. "It's an important couple of minutes now, Rochdale are in the ascendency looking for the killer goal, even before full-time. Northampton will be praying for extra-time." Into the closing stages at the Crown Ground and County are closing in on a second defeat in 15 games. This would be some result for Stanley who are technically 35 places below the visitors. Even more impressive given they trailed. We are into the final five minutes and Jake Cassidy's effort clears the cross bar for the side seemingly on their way out. "I've been impressed with Grubb and McClennan tonight. It'd be interesting to see with full-time training how they'd get on. Grubb in particular has been a handful tonight, if not a bit lightweight. In a few years time, with some full-time training under his belt he could be a player. Could teams like Bristol Rovers be looking at a few local lads? I don't know." This one's heading for extra-time, thanks to Rueben Noble-Lazarus who nets the equaliser on his home debut. Gary Sissons: The agony continues with York City. Can't kill games off and then we get what we deserve! Concord's Gary Ogilvie chases down a loose ball and Mansfield are relieved to see their keeper scamper off his line and clear the danger. He's got to go ref. And he does. Adam Chambers is deemed to have gone over the top of the ball in a challenge with Nathaniel Knight-Percival. This one looks like being filed in the 'upset' section. Shrewsbury are second in League Two, technically 10 places behind their loftier opponents. A superb comeback from AFC Wimbledon as they take the lead through Matt Tubbs who finishes well, with Adebayo Akinfenwa again the supplier. York supporters might want to think about making an early dent into their 220-mile trip home. "You could see the Cobblers defender running across the forward, it looked like he caught him. Northampton have got really lucky with that one. "The away side are getting stretched here and need to hang on going into the last 10 minutes. "But as it stands, this would be the Cobblers' biggest FA Cup win for a very long time. They haven't beaten a league side in the FA Cup since 2007." The game is end to end now. Ten minutes to find a winner. 600 seconds to unearth a new hero. Sheffield United go much more direct and it works as Ryan Flynn grabs his second of the game with a great finish. That should be that for the Blades, you have to say. Rochdale probably deserve an equaliser at Spotland and they almost get one when Jamie Allen's header strikes the bar from six yards out. James Collins coolly finds the net for Shrewsbury but is borderline offside and Walsall respond as James Chambers breaks through but is denied by a strong Jayson Leutwiler save. Still football in this. Dig deep Shrews. "That's the sucker-punch we talked about. It was a fantastic touch by Wellens to clip it over the keeper, who looked like he had it. You've got to take your chances at this level - Weston have had four or five this half. "They've been a different team since the break. They deserve a consolation, that's what they'll be looking for now." Adam Murray and Rakish Bingham are linking up well for Mansfield, who are beginning to dominate now. Murray is played into the area but shoots over the bar. "It's looking so ominous for Telford at the moment, you can almost barely watch. You get the feeling they just will not hold out if they continue to defend this deep. "Telford fans were so comfortable at 2-0 up, suddenly they are very, very nervous." Where could there be extra-time? Penalties? Well, thanks to AFC Wimbledon's equaliser, it looks like they could be keeping us all up a bit later. Though Mansfield and Concord Rangers are level, they are not playing a replay as their initial tie was postponed so the local kids will be in bed on time even if that one stays as is. The upset of the night seems to be coming at Southport. The Sandgrounders will face Eastleigh in round two if they hold on to a 2-0 lead against 10-man Dagenham. AFC Wimbledon draw level against York. Jack Smith converts after Adebayo Akinfenwa had headed the ball down. You can easily get Basingstoke confused for Barcelona, presumably a problem often faced by tonight's goalscorer Louie Soares. Doddfather Official: Did anyone else read that Basingstoke goalscorer as Luis Suarez? Richie Wellens clips the ball over the goalkeeper after making a fine run into the box. Next stop Oldham for Donny. Concord can do this, you know. They almost go into the lead through Jordan Chiedozie's looping flick but the Stags keeper makes a good save. Stefan Scougall leaps, pumps a header at goal, it's in...no, a brilliant save from Ben Garratt. BBC Radio Bristol's Ali Durden tweets: CLOSE! Clayton Fortune shot deflected wide as Weston start the second half brightly. online on your BBC local radio station. Alan Bennett fires wide for the Dons against York, who reached the semi-finals of this competition in 1955. Halcyon days. "That wasn't (Kevin) Keegan-esque, that was more like Michelle Keegan!" Concord are still in with a chance of overturning a 44-place gap in the league pyramid at Mansfield. They almost get in on goal but Jeremy Walker is flagged offside on the left flank. Less than half an hour to go now. Danny Hattersley is fouled, a penalty is awarded and he gets up to slam his side into a two-goal lead. "Michael Grogan had no complaints (21:01), he knew as soon as he made the tackle. When you're on a yellow card you cannot afford to go diving into a tackle like he did. "In five minutes this game has been completely transformed." Jake Cassidy comes onto the field for the first time in six weeks after a toe injury and his first touch sees him hit the crossbar. He found space but his effort catches the woodwork and is scooped up by the home keeper. Plenty of noise and passion coming from the Stanley fans and Notts County will have to dig deep here. Telford's Michael Grogan is sent off for a second bookable offence. Basingstoke believe they can do this, now. "Telford will be so distraught they've let Basingstoke back in in this way. Their defending was so poor, and that was so preventable. When the ball came to Basingstoke's Chris Flood he was surrounded by four defenders, how he was able to drive with the ball and pull it back for Louie Soares I don't know. "Momentum is key in this game and Telford couldn't really afford to concede an early goal in the second half with the score at 2-0. It gives renewed hope to the away side." York are pressing for a second at Wimbledon and James Shea has to be at his best to deny Jake Hyde. Sheffield United centre-back Chris Basham is correctly ruled offside after stabbing the ball into the net following a ball driven across the box from Ryan Flynn. Still largely one-way traffic at Bramall Lane. Nerves sweeping through the Telford ranks now. Louie Soares pulls one back for Basingstoke who, at fourth in Conference South, are only four places below the Conference's bottom club, Telford, in the league rankings. "Shaun Derry needs to make a move in this game now, he needs to change things. "Notts are under great pressure now, and Accrington have completely changed the complexion of this cup tie. "I've been concerned by some of the challenges in the middle from the away side in this game, especially since the opening goal, they haven't been strong enough." Upset on the cards. League Two side down to 10 men and down by a goal. Big questions. John Marsden collected a cross, took an age but found space and finished. Shrewsbury's Liam Lawrence. 20 yards out. Back of the net. What have you got Walsall? The visitors have started better in the second half as they look to reach the second round for the first time since 1997. Already a dangerous break has seen Telford's Michael Grogan booked. Still plenty to do, though. Marcus Carver ends a run of eight games without a goal and what an important strike that could be. County could not complete a clearance and his shot loops into the net. It may have taken a deflection and Roy Carroll was helpless to keep it out. Yeovil would be next for Stanley but 40 minutes to hang on is a long time. Walsall were under pressure in the first half at Shrewsbury but they start the second period positively and a ball fizzed across the goalmouth evades all their players. Preston await the winners of this one and the opening goal looks more and more likely to be decisive. The referees are giving their whistles their first airing of the second half. Game on. Jay Graham: The magic of the FA Cup first round replay at Southport's Haig Avenue under the floodlights. Lukas Taylor: Would like to see Donny push for five or six, really make Oldham feel nervous about playing us next round. "Ade Akinfenwa and Matt Tubbs have looked dangerous for Wimbledon. But York have dealt with them and looked very solid in response, and if they can combine that with being braver in the second half, they are capable of getting more goals in this. "They need to have more confidence in the second half and ease the tension, because there are goals in this game for them, but they are looking very likely to come away with a win that would upset the bookies." Former Sheffield United striker Keith Edwards on BBC Radio Sheffield: "The only disappointment for Sheffield United is allowing Crewe two really good opportunities. Take that out of the equation and United have been totally on top - we probably haven't worked their keeper enough but Crewe are lacking in confidence and are there to be beaten." How do you report on a match that gets postponed before kick-off? That was the daunting prospect for young Weston-Super-Mare fans Harry and Charlie when tonight's teams were first scheduled to meet on 8 November. Fortunately the pair had the support of CBBC Kickabout team Radzi Chinyanganya and Ed Bearryman, who were equally as gutted to see the pitch declared waterlogged shortly before kick-off. BBC School Report website here. Former Derby County and Notts County defender Dean Yates for BBC Radio Nottingham: "A great shame to concede before half-time with just over a minute left to the break. Not a lot you can do about that though with such a good ball across the six-yard line. That goal can change things massively and Notts have to fight back in the second period as they may have to weather a storm. If they continue as we are, you can only stand the pressure for so long. Shaun Derry will need to ask for more from the players." Half-time whistles sounding around the country. Can Concord bag another? Will Southport shock Dagenham? What formation will Keith Hill make up next? Plenty to look forward to in the second half. Job done for Donny - James Coppinger finishing in style after good work from Richie Wellens. League One class rising to the top now. Dagenham's Luke Howell is shown a straight red card for raising his arms to Luke George. A massive opportunity for Port to now win a first game against Football League opposition for the first time since 2002. Luke Joyce stoops at the back post to head Stanley level and boss John Coleman will now have a positive team talk to deliver at half-time. Concord Rangers fans have taken to Twitter in their droves to celebrate their side's equaliser at Mansfield. Steve Foster: 32 minutes gone and you would think Concord Rangers are the league side. Offering a lot more quality than Mansfield. Still 1-1. Charlie Toon: Not going to lie did not expect Concord to make up for the mistake that quick but well done but still come on you Stags! Tim Chambers: Well done to Jordan Chiedozie, son of a Spireite, scoring for Concord Rangers at Mansfield tonight. Time for a couple more. The name of Concord's goalscorer Jordan Chiedozie might sound familiar to some, because he is son of the former Tottenham Hotspur, Notts County and Nigeria international, John Chiedozie. Out of nothing, Crewe go straight through the middle of an inattentive Sheffield United defence and are inches away from an equaliser as Brad Inman hits the post after a superb pass from Anthony Grant. A warning sign for the Blades who have been totally on top so far. Concord midfielder Tony Stokes sees glory when he goes for a volley, but his effort ends up safely perched in the Quarry Lane End. Theo Robinson doesn't miss twice - the Rovers player tapping in from close range after another good save from Luke Purnell. "Robinson really should have hit the back of the net, but the keeper (Luke Purnell) did well to make himself big. Weston are staying in the game due to Doncaster's poor finishing. Really, they should be 3-0 up." 4-4-2 is dead. It is in Rochdale anyway, where the club has tweeted that manager Keith Hill has reverted to 4-1-2-1-2. Does that even add up to 11? Hang on... Yep, it does. Goal scorer Ronan Murray shapes to shoot but slides a lovely ball through and Michael Petrasso converts for County only to see the referee's assistant stood with his flag up. The lead remains at one and seconds later the visitors have a penalty shout but the officials decide on only a corner. Garry Thompson the man hauled down by the Stanley keeper. "That goal is a major bonus for Telford, just as Basingstoke were having a good spell. "Similar to the first goal, Basingstoke were starting to turn the screw and put pressure on, but Telford have just gone up the other end and scored. For a poacher of his ilk, you would never have expected Tony Gray to miss." Bobby Grant fizzes a free-kick through the Walsall wall and though Richard O'Donnell spills, he gathers as James Collins looks to gobble up the rebound. Who else? Good old Tony Gray for Telford. The big man taps home Sam Smith's centre. Theo Robinson... surely... no! The Doncaster man takes aim from eight yards out, but Weston stopper Luke Purnell makes a fine save to keep his side in the game. Sean Cooke picks up a wayward defensive pass from Basingstoke and advances towards goal but he drags his shot wide under little pressure. Former Sheffield United striker Keith Edwards on BBC Radio Sheffield: "Crewe have decided to get everyone back behind the ball already. That early goal has put them right on the back foot and they look like a team you can pressurise into mistakes at the back." Former Derby County and Notts County defender Dean Yates for BBC Radio Nottingham: "This is a proper cup tie. Both sides are well up for this and it's a really good game. Notts are ahead but coming under a lot of pressure. That said, that's when Notts have been at their most dangerous this season. They are a real threat on the break." Enda Stevens brings down a Seagulls player in the penalty area. The hosts appeal for a penalty. Nothing doing. "Good instinct from Main, there. He's got into the box, been alert and guided it in. It's bad marking from Weston, though. They'll be disappointed." Robert Procter: What Shaun Derry is doing at Notts County is truly astonishing, he's one of our own!! Come on you pies! Rochdale are battling to get back into this - Stephen Dawson breaking into the box but seeing his cut-back hoofed clear. Moments later, the Irish midfielder's goal-bound effort from the edge of the area is blocked. AFC Telford United on Twitter: Grogan, Poku and Hancock playing from the back. Confidence is showing..
"Telford have only kept one clean sheet this season, in the previous round against lowly Spennymoor. They have been hard to come by. "Though there have been signs of recovery in the league for Telford, they have still only won three games, so to beat Basingstoke, who have been on good form in comparison, would be a real banana-skin victory for Telford, even though there are only four places between these two teams." Moments after Crewe miss a stunning opportunity to take the lead, Ryan Flynn is in the right place for Sheffield United. He turns in from inside the six-yard box after the Blades work a short corner. Alex will be furious they have paid such a price after Callum Saunders fired a rebound straight at home keeper Mark Howard. Absolute stunner of an equaliser, all the way into the top corner from Jordan Chiedozie. Superb riposte from the non-league side. Another non-league side falls behind, as Danny Glozier deflects past his own keeper. A goal which Doncaster fully deserve - Curtis Main bagging for the visitors. It's the hosts who are dominating early on and Matt Rhead should do better when he shoots over after good work from Lee Beevers. Advantage to the League One side as Blair Adams whips in a cross from the left and and after the ball is only half-cleared, Ronan Murray is on hand to strike the ball home. The stadium announcer awards the strike to Michael Petrasso but have no doubt, Murray has broken the deadlock, his fourth goal in all competitions this season. Andy Parry, who is on loan from Luton, puts AFC Telford into the lead. A decent start for a side who have only won three times in 20 games in the Conference this season. BBC Radio York Sport: WHAT A GOAL. Take a bow Wes Fletcher. It was a superb strike from Fletcher to open the scoring against Wimbledon, one to pencil in for viewing on the BBC Sport website on Wednesday morning. Mike Grogan fires wide twice in succession. He needs to sharpen that radar as the hosts look to make the most of their early inventiveness. The Daggers look to exert themselves on their non-league opponents early on as Ashley Chambers delivers a good cross onto the head of Rhys Murphy but he only finds the side netting. "Weston can count themselves lucky there. I didn't see much wrong with that." MNG: Rochdale's manager Keith Hill is a dead ringer for Davos Seaworthy from Game of Thrones. Perhaps he should ask the Iron Bank from a loan. There is a photo of Keith Hill looking mighty impressive at 19:34. Conference South side Weston-Super-Mare will look to make it as uncomfortable as possible for their more illustrious League One opponents Doncaster tonight, that started with the size of the tunnel. Weston-Super-Mare are given a huge let-off when Paul Keegan's strike from a corner is chalked off. Wes Fletcher lashes home from outside the box. York 1-0 up. First goal of the night - hurrah. Ivan Toney heads home a free-kick from Darren Carter. Curtis Davies will be pleased. Accrington Stanley are underway as they try to humble League One Notts County. No room for intent focus on the pitch early on as the locals make their voices heard: "Oh Lancashire is wonderful," they sing. Their side start confidently with good possession early on and defend a Nicky Wroe corner solidly. Right then, it's time to sip up the Bovrils, finish the pies and find out who's heading into the second round of the FA Cup. We're getting under way in all nine of our ties now. Pete Simpson tweets: The woodspringeth riseth. The last time Southport humbled Football League opposition was in a 4-2 win over Notts County 12 years ago. Port banked on two goals from Steve Pickford that day and such are the memories this competition creates, he can recall every moment. "I still remember everything about that day," Pickford tells the Liverpool Echo. "It was the highlight of my career. When the tournament got to the cup final one of my goals was shown and compared to one by Thierry Henry." BBC Radio Shropshire's Stuart Dunn tweets this picture of Walsall's arrival at Greenhous Meadow, ahead of their replay with Shrewsbury. running Chelsea close in a 2-1 defeat in the Capital One Cup fourth round. BBC Radio Shropshire's Nick Southall. "The Bucks lost captain Sean Clancy last week with a broken collar bone and centre-back Neil Byrne was stretchered off at Barnet with a serious ankle injury. "It's been a torrid few weeks, but Watson says 'positives can come out of a negative situation' and he'll be hoping his remaining fit players will do enough to see off a strong Basingstoke side in front of a big crowd here this evening. "If they make it through, it'll be the first time the club has reached the second round in the cup since reforming 10 years ago." Weston-Super-Mare manager Micky Bell on BBC Radio Bristol: "If Warrington played Exeter in a friendly 100 times, they'd probably lose 100 times. "There's something about the FA Cup that can make it happen." Northern Premier outfit Warrington beat League Two Exeter City in their first round tie. Bell's Weston-Super-Mare, of the Conference South, face a similar challenge tonight against League One opposition. A cold and dark November night in Rochdale awaits Northampton and their supporters as they bid for a place in the second round of the FA Cup. he said: "It can be a very important game financially. This is a difficult fixture, Northampton at home, but it's a good opportunity to play a game and we're on a good pitch, we're on a great run of results. I don't see why we can't progress, but it's going to be a difficult task." Mansfield Town on Twitter:For those asking, Bishop on the bench is Adam Bishop - our youth team goalkeeper. Not (comedian) John Bishop, who played for Southport many moons ago. It looks welcoming at Shrewsbury doesn't it? But the Shrews sit second in League Two and will hold little fear against a Walsall side struggling in the league above them. A trip to a side steeped in FA Cup history - Preston North End - awaits the winners and the home side, managed by Micky Mellon, are in fine form, with six wins in eight. Shrewsbury: Leutwiler, Goldson, Grandison, Knight-Percival, Demetriou, Woods, Wesolowski, Lawrence, Grant, Akpa Akpro, Collins. Subs: Ellis, Vincent, Vernon, Wildig, Griffith, Halstead, Clark. Walsall: O'Donnell, Purkiss, James Chambers, Downing, Taylor, Adam Chambers, Cain, Cook, Sawyers, Forde, Manset. Subs: O'Connor, Baxendale, MacGillivray, Benning, Flanagan, Grimes, Clifford. Karen Rossiter: FA Cup at the second attempt! Weston-Super-Mare fans can finally dare to dream tonight as their side face League One Doncaster for the first time in the first round proper. The original fixture was postponed on 8 November. AFC Telford United are within touching distance of a little history tonight because, in their 10-year existence, they have never previously reached the second round. But is all that about to change? The winners of this tie will visit Bristol City in the next round, and Telford manager Liam Watson expects passionate support at the New Bucks Head tonight. "I just think being back home with the crowd behind us help us,"
Watson said. "But we have got to give the crowd something to get behind and hopefully we can do that by playing well, getting an early goal or something like that, and then go from there." AFC Telford: Hedge, Higgins, Akrigg, Parry, McDonald, Cooke, Grogan, Poku, Hancock, Gray, Smith. Subs: Barnett, Farrell, Pryce, Platt, Todd. Basingstoke: Moore, Smart, Ray, Gasson, Bird, Harper, Brown, Soares, Dunn, Flood, Williams. Subs: Rice, Macklin, Owusu, Smalley, McAuley, Charlick, Jenkinson. 10-man victory over local rivals Doncaster on Saturday. The Blades brilliantly made it to Wembley - albeit the semi-finals - last year and with four FA Cups in the trophy cabinet, have pedigree. They hammered Chelsea 3-0 100 years ago this season to win their third trophy and in Crewe, face a side 18 places below them in League One. A trip to Plymouth Argyle awaits the winners. Accrington Stanley: Rose, Liddle, Aldred, Atkinson, Winnard, Joyce, Procter, Mingoia, McCartan, Molyneux, Carver. Subs: Windass, Gray, Hatfield, Naismith, Simpson, Hunt, Roddan. Notts County: Carroll, Cranston, McKenzie, Hollis, Curtis Thompson, Adams, Wroe, Traore, Petrasso, Garry Thompson, Murray. Subs: Cassidy, Jones, Noble, McGowan, Spiess, Whitehouse, Harrad. Steve Bowyer on Twitter: Show me a better food and drink combo at a football match tonight! Bucks pale ale too! Jose Mourinho's Chelsea have won plaudits for their form this year, not least for being unbeaten on the road. Shaun Derry's side can boast they are the only other side in England to have not lost away from home this season. Southport and Dagenham and Redbridge will be licking their lips as a win here presents a home tie with Conference side Eastleigh in round two, offering a great chance of a third round berth. Port are on a run of five unbeaten in the league but in Dagenham, face a side who know how to reach round three, making it in both 2008 and 2012. Worryingly for the League Two side however, they have not scored an FA Cup goal in six games, with their last arriving three years ago. Southport: Raya, Mitchell, McDonald, Connor, Fitzpatrick, Rutherford, George, Joyce, Austin, Hattersley, Marsden. Subs: Lloyd-Weston, Challoner, Foster, Evans, Lynch, Smith. Dagenham & Redbridge: Cousins, Batt, Saah, Partridge, Hemmings, Chambers, Labadie, Howell, Bingham, Cureton, Murphy. Subs: O'Brien, Doe, Doidge, Porter, Green, Goldberg. Tired? What does that mean? League One Notts County face the threat of a humbling from a side a league below them in Accrington Stanley tonight but one man may be too tired to notice the threat. played twice in 24 hours respectively over the weekend for Northern Ireland in Romania and his club side respectively. He managed a clean sheet in the second encounter but will three games in five days prove too much? Stanley have won just one in in four and will need to be at their very best to overcome a side 35 places above them in the pyramid who have one loss in 14. Yeovil await the winners. Concord Rangers manager Danny Cowley has been speaking to BBC Essex: "It's been a long time coming this game. But we've had a good week. "People on the outside may have thought we wouldn't be focused on the Boreham Wood game, but our players are really honest and hard-working. "We've lost one in 15, so we're in a good place and we go to Mansfield with nothing to lose. If you're honest, you win this game one time in every 20, but we go into it believing it's going to be that one time." First thing's first... who are Concord Rangers? Well, they are a Conference South side who are based on Canvey Island in Essex. Extra points if you knew that already. Nicknamed the Beach Boys, the club are enjoying their most successful spell since being formed in 1967, and chairman Antony Smith is relishing tonight's visit to Mansfield: "For people far and wide, there's probably no chance they'd have heard of us before this. "Just to see the club's name come up in the live draw, with Phil Neville pulling us out, was fantastic." Laura Rawlings tweets: Good luck Weston-Super-Mare! The radio's on and ready for the big build up on BBC Radio Bristol. Go for it! You can listen all our local radio commentaries online and keep tweeting us throughout all the FA Cup twists on #bbcfacup. Doncaster manager Paul Dickov might be forgiven for feeling the pressure tonight. Rovers are struggling in 17th in League One after losing to Sheffield United at the weekend and a defeat to Weston-Super-Mare would not go down well with the League One club's supporters. Dickov was in bullish mood when asked if he is feeling the strain: "No, not at all. In the last few games we've drawn against a very good MK Dons team, we've beaten Bradford and we've matched a team (Sheffield United) who I believe are right up there. "The result didn't quite go our way, but from that point of view we've just got to carry on and keep improving the performances." Tonight's match at the Woodspring Stadium is one of two ties which are not replays, with bad weather intervening on first-round weekend and wiping them out. Mansfield v Concord Rangers being the other. Which is a shame, because I'm sure Donny manager Paul Dickov was looking forward to sitting back and soaking it all in from the dug-outs. Have a look at this picture of the WSM dug-outs (below). It looks like the chairs have been borrowed from Brian Potter's Phoenix Club. The prize is massive. All of the sides in action tonight know they are just two wins away from a potential clash with a Premier League heavyweight in the third round. And that is why the league clubs will be doing everything in their power to make sure they aren't being talked about in tomorrow's newspapers, and on Thursday's fish and chips wrappers. Up and down the country, non-league footballers are beginning to dream. Again. The postal rounds and plastering jobs have been put on the backburner, and 'out of office' replies set up on work email addresses. Tonight, these semi-professional footballers have bigger fish to fry. And they want to make sure those bigger fish are all over tomorrow's sport pages. It's time for more FA Cup thrills and spills. Let's get stuck in.